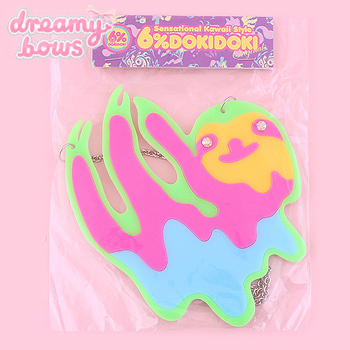 This amazing statement necklace features a huge acrylic sloth in a melty design. The long chain gives the necklace a more impactive look and can be layered with other necklaces for a more dramatic Harajuku look. The rhinestones forms the eyes of the sloth and paired with the neon colours it gives the necklace a psychedelic look!